At JPG’s fashion show influences from many different countries wore used in the designs. We got a taste of Africa, Russia, India and Mexico. The styles from those countries were represented by extravagant headwear and folklore designs. There seemed to be so many different influences, it was hard to tell which country they belonged to. Colorful African turbans were combined with satin dresses with chinoiserie prints. Black trenchcoats or fur coats were worn on top. 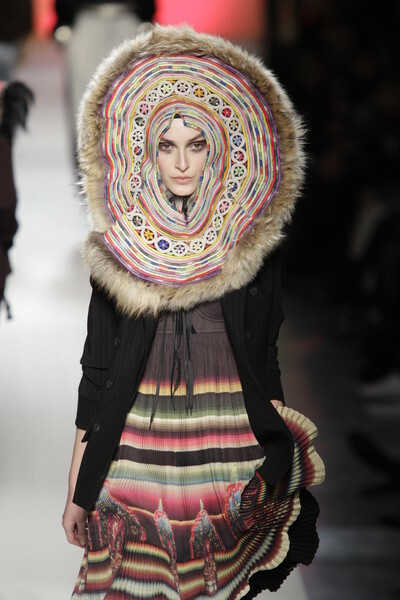 There were colorful printed headscarves, fur hats and metallic Indian headpieces. The models wore Masai necklaces combined with Western motorcycle jackets. They walked in harem pants with fur waistcoats. Their neon colored leggings heavily clashed with the folklore prints on their clothes. But it was all part of JPG’s cultural fashion explosion. Words can not even describe how wacky it all looked. While the clothes varied in almost every aspect (shape, size, fabric, color) not much was to say about the collection in general. Apart from the fact that it was a cultural melting pot. Between all influences JPG’s famous cone bra popped up every now and then. Though we loved watching the crazy styled outfits, the coats were the best pieces of the collection. And the message of this show might just have been about embracing the cultural differences in the world and turning them into something of your own. At least we think that would be a nice approach.